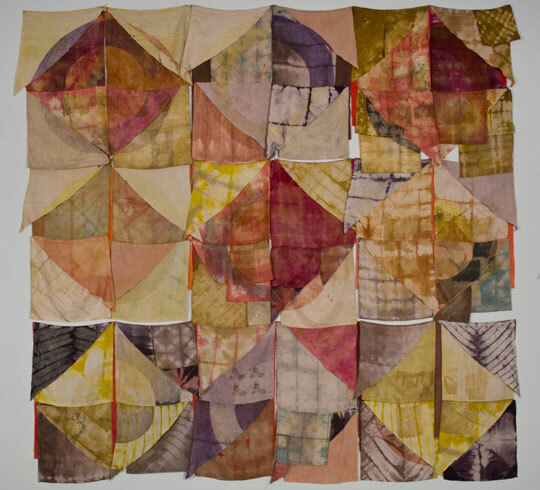 Old discarded table linens, natural dyes, cutting, piecing and stitching. Frances Dorsey, Beleaguered and Prevailing Moons, 2016. Multi-shaft weaving mordanted before and after weaving and dyed in Middle River goldenrod dyebath, bottom dipped in woad. 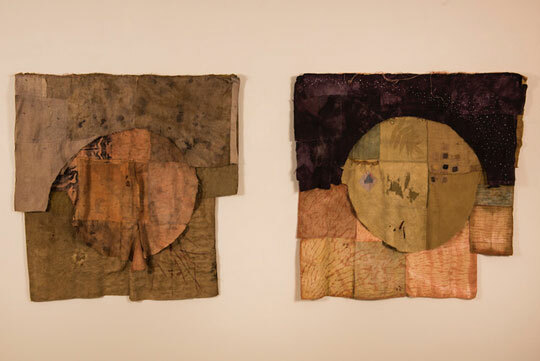 Frances Dorsey, Golden Moon #4, 2014. "Cloth speaks so eloquently perhaps because it receives one's impulse and then always replies, pushes back - often in an unexpected way. 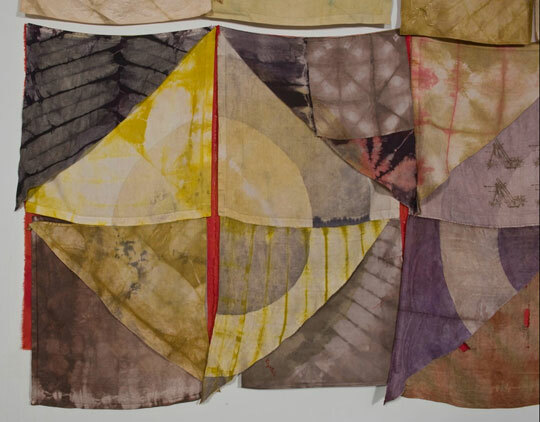 Working with the material itself becomes a conversation, it is a receptive surface upon which to record thoughts and experiences of ordinary daily life while it answers back in sometimes surprising ways. 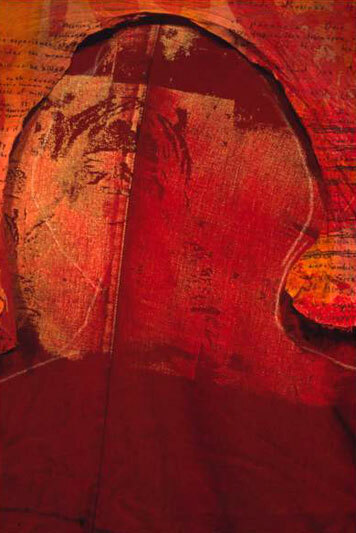 The saturated colour possible with dyes is unparalleled. 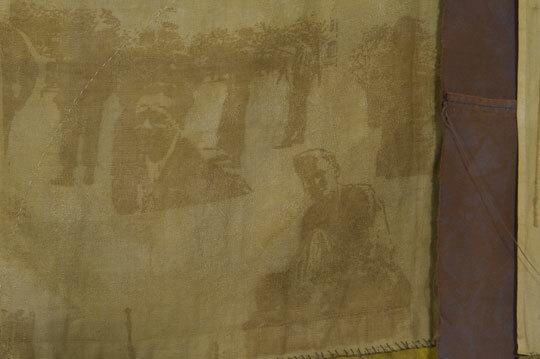 Cloth responds to gravity, it is tactile, it is a physical and emotional medium, it talks to the human body but retains its own voice, resisting domestication." 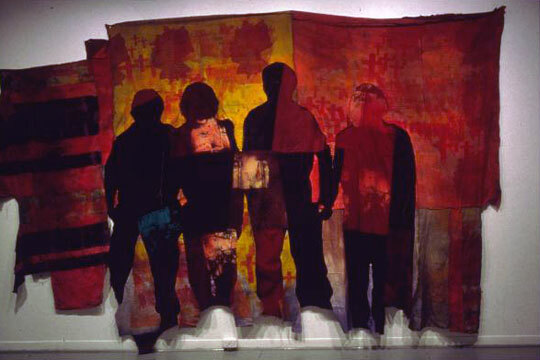 "For me, cloth offers a kind of language to help figure out the world and reflect upon seemingly inexplicable events. 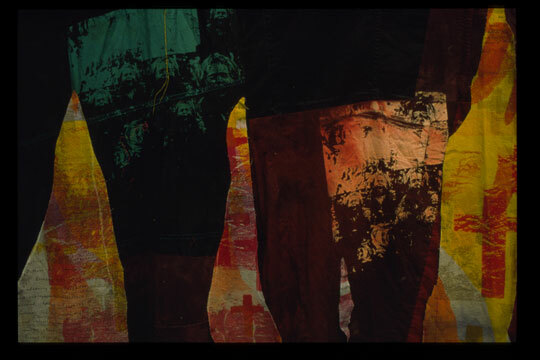 It offers a way to respond to the historic events that encompass my life-a personal, unpretentious way that acknowledges how everyone is included and implicated in the larger picture. For example, I have traced the line of damages that war (WW II initially) can mark onto subsequent generations, later the beginnings of the Vietnam war, and tried to understand how all of these big events penetrate into the smallest corners of our lives." "Lately, however, I find myself tired out by war, this seemingly unstoppable avalanche of misery, cruelty and stupidity that is incomprehensible in its endlessness. Rather than absorbing the weight of sorrows of wars past and losses made no less poignant by the passage of time, I am drawn to how simply beautiful a colour is, the gorgeous richness of a saturated natural dye from the fields nearby, how seductively lush is the heft, surface and texture of an old linen damask tablecloth, how satisfying the touch of a beautifully woven piece of cloth; the miraculous minor details of existence. I am stopped in my tracks by the sight of a field of goldenrod in bloom." 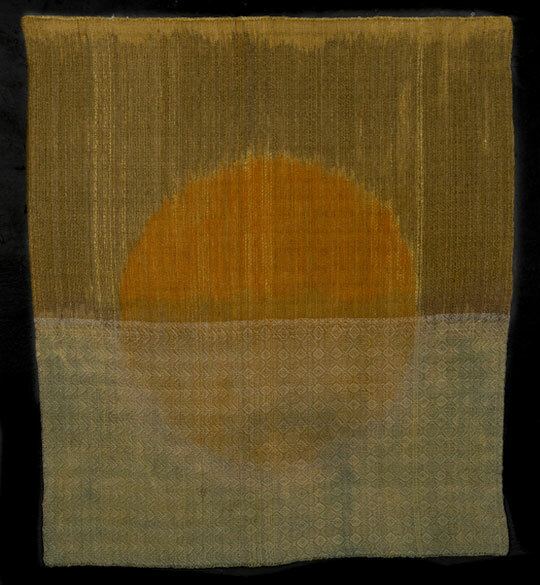 Multi-shaft weaving mordanted before and after weaving and dyed in Purcell's Cove goldenrod dyebath. 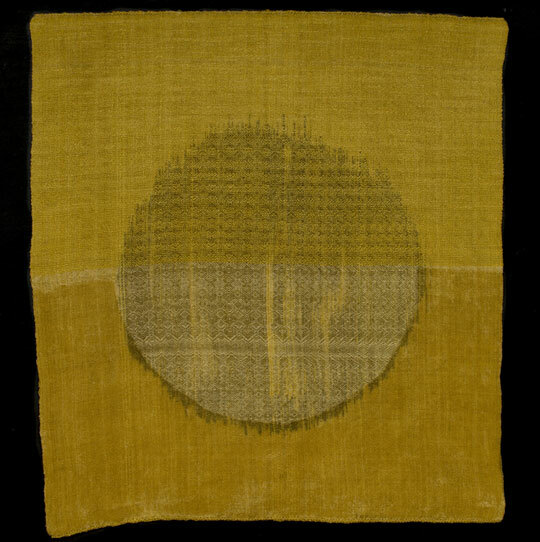 Frances Dorsey, Golden Moon #3, 2014. 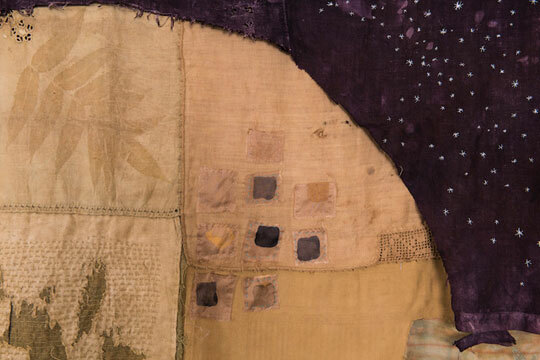 Detail - Golden Moon #3. Multi-shaft weaving resisted and dipped in woad bath. 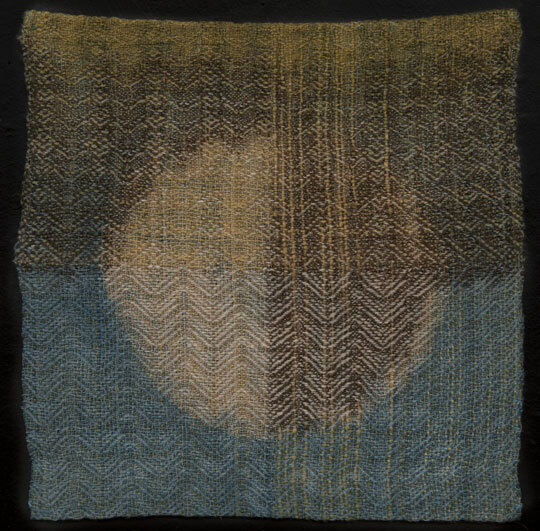 Frances Dorsey, Woad Moon, 2014. 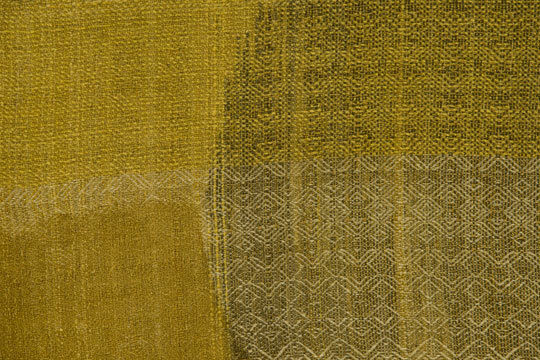 Multi-shaft weaving, mordanted before and after weaving, and dyed in Middle River goldenrod dyebath. 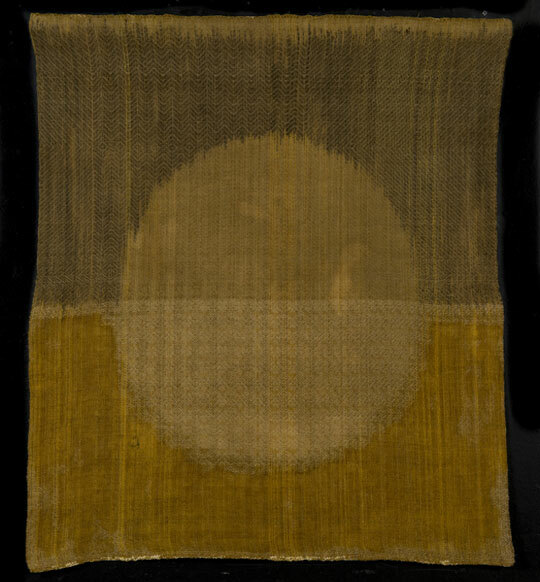 Frances Dorsey, Golden Moon #1, 2013. 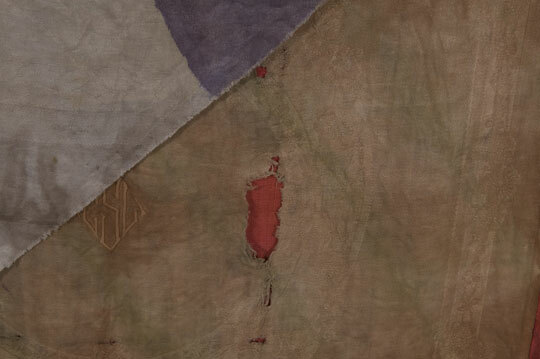 Detail - Golden Moon #1. 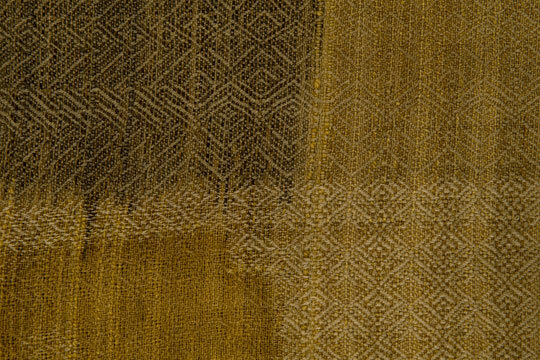 Multi-shaft weaving mordanted before and after weaving and dyed in local goldenrod dyebath, resisted and dipped in woad. 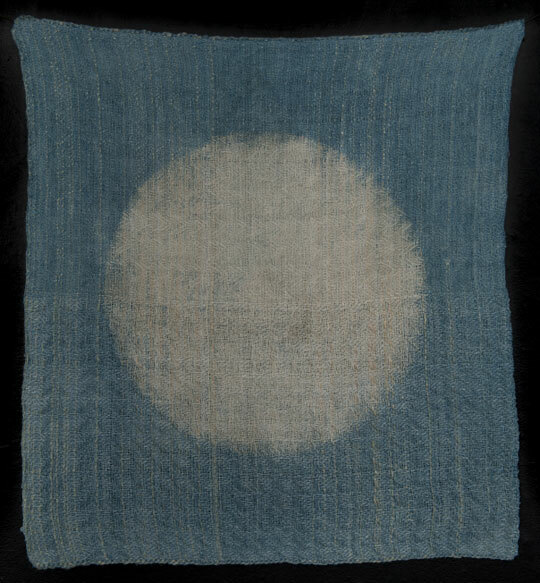 Frances Dorsey, Small Moon #5, 2013. 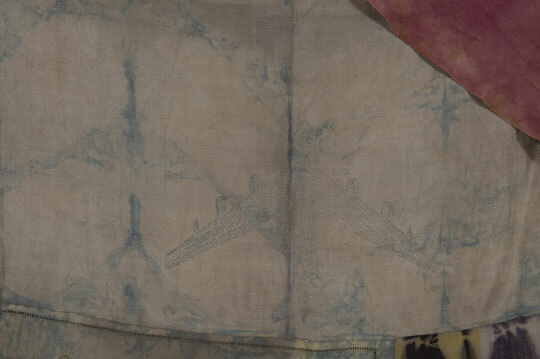 Natural dyes and extracts; dyed, printed, discharged, cut up and recombined used table linens, layered. Frances Dorsey, Shot Through the Heart, 2010. Detail - Shot Through the Heart. 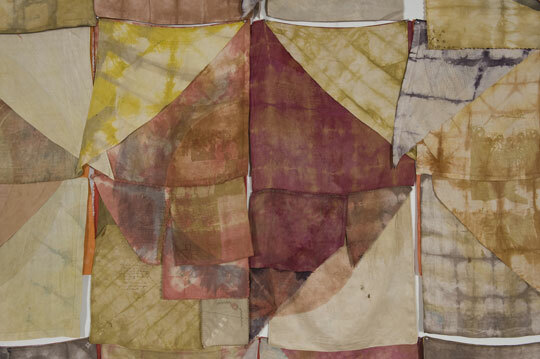 Fibre reactive dye and pigments; dyed, printed, discharged, cut up and recombined used cloth, layered. Frances Dorsey, Dragons' Teeth, 1994.